On October 18th we are on the 11th day of the Moon, and this means that whatever you do will get * supercharged *. Sometimes all you need is 1 good practice that brings you right back into alignment! – If you are ready to let go of the parts of you that don’t serve you anymore. – If you want to experience a stronger connection with your intuition. – If you are ready to feel your happiness on a daily basis. – If you want to experience more inner peace. – If you want to eliminate (negative) thoughts that don’t serve you. – If you want to connect more to your passions. – If you want to keep mastering your inner power. – If you want to trust your own feelings more. – If you want to learn how to listen to the sounds of your soul. – If you want to be more in sync with the flow of your soul’s voice. – Changing your neural patterns and subconscious feelings and thoughts. 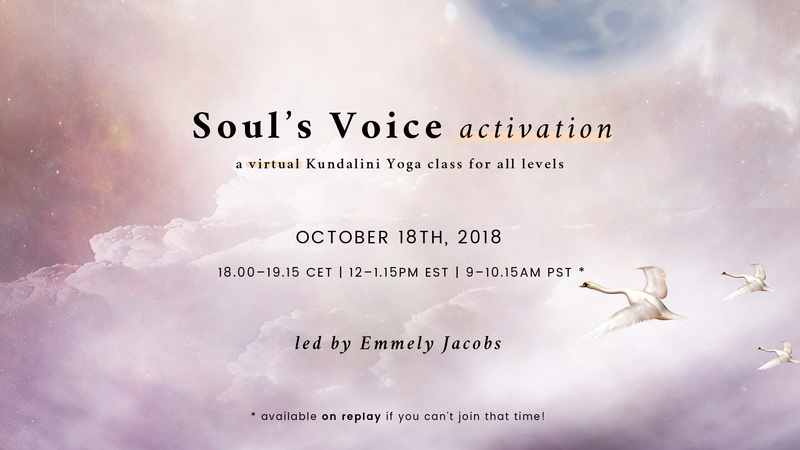 Available to view on replay online for one week following the class (till October 25th). On Thursday you will receive the Online streaming details, and a “Knowledge sheet” to make sure you get the best out of the class! I’m so happy you are ready to take yourself to new heights, see you in class. 1) October 18th is a 1+8=9, so we’ll have a focus on the “Subtle body”, 2) Thursday is a Jupiter day, everything we do will expand, so we’ll do a Jupiter meditation, 3) it’s the 11th day of the Moon, and the 11th body is the sound current, so we will use extra sounds (e.g. relaxation with gong).